Home > News > News > You Could Win a Lancaster Getaway! You Could Win a Lancaster Getaway! 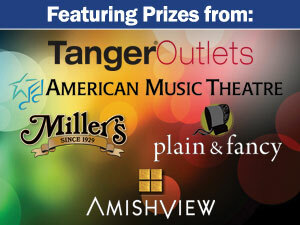 American Music Theatre has teamed up with Tanger Outlets, Miller’s Smorgasbord, Plain & Fancy Farm, and Amish View Inn & Suites to offer you a chance to SHOP, SEE, and STAY in Lancaster, PA with a $1,000 EnjoyLancaster.com prize package. Ready to enter for your chance to SHOP, SEE and STAY in Lancaster, PA?Just click here!